DSLR (digital single reflex lens) cameras can do amazing things but they are incredibly intimidating for new users. All of the buttons, dials and menus can be a real turnoff for people hoping to get into photography. I find some of the point and shoot cameras to be even more confusing. The aim of this blog page is to help new users understand the base set of controls they need to understand to start with, and maybe forever. Let's start with that ever present dial on the camera. You know, the one with the Professional (P) option. OK, so P doesn't stand for Professional but rather Program. This setting will ensure a properly exposed image but not necessarily the creative exposure you are after. You are telling the camera to take control and it will do the best it can. You might end up with a shot that has the background blurred out when you wanted the whole thing in focus or you might end up with a portrait with everything in focus when you wanted the background blurred. NOTE: We are going to talk about storytelling vs isolation shots as well as freezing or blurring motion. You may want to review the Creative Exposure page. 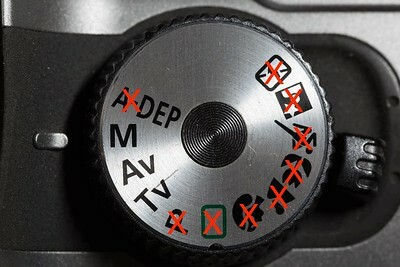 If you look at the Canon EOS XTi dial (figure 1) you will see twelve options. Exactly 1/4 of those options are all you need. Let's look at some of the options you don't need and why you don't need them. Portrait mode assumes you have a foreground subject and you want the background to be out of focus. In other words you are telling the camera you want an Isolation Shot. You accomplish the same thing by selecting Aperture Priority mode (Av in the Canon world) and selecting a small f-stop number. Landscape mode assumes you want to have the entire shot in focus. You can do the same thing by once again selecting aperture priority mode and selecting a large f-stop number. One of the dangers of letting the camera choose the settings for this is that you give it the right to choose whatever ISO speed will allow for the aperture selected which can result in a lot of noise in the shot. Noise can actually kill a shot. Controlling this yourself you can control the ISO speed yourself and if the shutter speed is too slow you can put your camera on a tripod and capture your low noise shot that is in focus, front to back. Sports mode tells the camera you want to freeze the action. And once again, you give the camera the permission to choose whatever ISO speed is needed to make the shot happen. You simulate this mode by selecting Shutter Priority mode (Tv in the Canon world) and choosing a high shutter speed. Let's say you want to blur motion. There are many instances where creatively you would want to blur motion. Light painting is one example. Another example is capturing motion to show movement in a speeding train. Guess what. You can't blur motion with any of those options on the dial. Only by choosing a slow shutter speed can you do this. Choose shutter priority and select a slow shutter speed. ARE THESE GUYS MASOCHIST???? What in the world were they thinking. I can understand a top level professional camera having many, many, menu options. Hopefully someone who is willing to spend $4,000 or more already has a firm understanding of photography. But for the beginner buying their first DSLR? Maybe it should come with a stripped down menu with the option to turn on all options. These are some of the basic tasks you need to be able to perform with the menu. 1. Select the image quality. JPG or RAW. But they have to include options to choose large, medium, and small versions of each of the formats? Isn't this the 21 century? I don't know why someone would choose anything other than the large option. 2. Erase images or format the memory card. 3. Set the LCD brightness. Maybe. You should probably get familiar with the functions of the menus and wheels on your camera. You will use these to do things like, review photos, erase photos, set the shutter speed, aperture, and ISO speed. If your camera has back button focus, I would suggest learning to use it. Normally, you focus when you press the shutter speed half way. Back button focus places a button under your thumb on the back of the camera and can be very helpful in your photography. If you are using a tripod, you can use the back button to focus on an object then when you press the shutter button you don't have to wait on the camera to refocus. It also adds stability because you are gripping the camera with your thumb as well has your fingers and palm.